Cargo stuffing Rotterdam - Mainport Warehousing B.V.
Mainport is ideally located for cargo stuffing, right next to one of the large terminals at the port of Rotterdam. 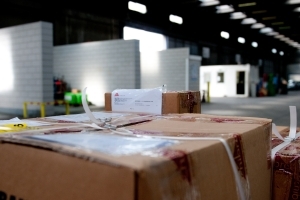 With over 25 years of experience, we are well equipped and connected to take care of cargo stuffing, unpacking and repacking, and additional services. Neighbouring the largest short sea terminal in Rotterdam we can very efficiently Cross Dock all your cargo to European destinations. Inquire about the possibilities for cargo stuffing in Rotterdam by calling our customer service department. Our offices and warehouses are located in the heart of the port of Rotterdam, in the Waalhaven docklands close to the Beatrixhaven and the Eemhaven. Our location is roughly 1 km from the A15, an important European transport artery. In addition Mainport has rail- and deepwater connections. While in storage at the port of Rotterdam, cargo stuffing is done by our dedicated team of professionals. Once clearance is granted, your cargo is ready to be shipped out in an instant. For a more detailed description of our services, please contact Mainport by calling at +31 (0)10 495 4360.